Editor’s Note: Reusable Learning Objects attract researchers as a modular architecture for distance learning. Significant work has been done by the US Military (SCORM), by companies such as Oracle, and by University systems in Canada and elsewhere. Each new iteration brings us closer to a universal system with a repository of proven and flexible learning objects. E-learning technology is driven by several factors. Among these factors is the principle of sharing and reusing existing teaching materials. This is in addition to the possibility to personalize courses according to several criteria such as the preferences, capabilities and students’ needs. In this paper, we analyze the existing standards and technologies related to the subjects. We aim at providing an original technique for a modular architecture of an e-learning system which allows designing and implementing an e-generation course. The e-generation course maintains a consistent view on the entire authoring process, and provides automation of courses based on an existing atomic learning object in a course repository. The process of e-content structure is objectives-based. To create a course the author has to be aware in each step of the course generation of the objective and the relevant information for the learner. Keywords: course e-generation, atomic learning object, e-content structuring, content management. E-learning is growing very fast and with the spread of broadband Internet and the growth of information technology, many e-learning solutions have been developed   . However, existing e-learning solutions focused more on the convenience of construction and management of solution provider but less on the reusing and adapting learning objects respectively in and to different contexts. To provide such features, in this paper we analyze current standards and proposals for e-learning system architecture. The emphasis is on the technical structure and system components but also e-content management is described. Therefore, many e-learning systems have been developed to improve science education in recent years . These systems aim to provide high quality educational resources for students and teachers and help them build up their own courses through various learning services and reusable learning objects. Existing e-learning systems have several sets of technology standards, each of which is based on a specific authoring tool  . However, most authoring tools are designed to create an e-content with a set of objects. Nevertheless, the reusability of the e-contents objects remains relatively low. In order to increase the reusability of the e-content objects, we present in this paper a solution of an e-generation course which has been designed and composed by re-usable entities This course offers an authoring tool that facilitates the building of e-content based on a particular structure called pedagogical learning objective. The proposed solution allows publishing, updating, deleting reusable learning objects, and creating course structure. The system provides the opportunity/possibility to define the e-content repository that enables uploading, classifying and accessing of reusable learning objects. The paper is organized as follows: Section 2 gives a related work of a basic e-learning system and what services are generally offered by different e-learning platforms. Section 3 describes the proposed e-generation course component based on the learning content manager. The latter offers a set of tools for the managements of courses, lessons and teaching materials. Section 4 concludes the paper and presents our future work. E-learning, in general, can be seen as technology-delivered or technology-enhanced learning . Therefore many architectures of online education have been developed   . The goals of the different solutions can differ and so the offered functionalities because they are impacted by various aspects including available technologies, pedagogical principles  and , usability, true awareness and benefits as well as cultural impacts. The most common standards are Blackboard , WebCT , Moodle , ALFANET , and LRN. Blackboard  provides course and content management systems, collaboration tools and a number of other services combined in an “Academic Suite” and a “Business Suite”. It is one of the most popular and successful commercial e-learning systems. It can be extended according to own needs. WebCT  was a commercial Course Management System. WebCT's solutions are designed to address the needs of the entire educational enterprise – from administrators serving the needs of a broader student demographic, to students and faculty looking for ways to enhance teaching and learning. In 2006 WebCT was acquired by Blackboard. Moodle  is a free Course Management System (CMS). The lesson module of Moodle provides different learning paths. ALFANET   was developed within an European project from May 2002 to April 2005. Its architecture is service-oriented. It uses multi-agent technology and it is based on several standards  such as IMS-LD, IMS-QTI, IMS-CP, IEEE-LOM, and IMS-LIP. Those platforms provide authoring tools based on the ADL Sharable Content Object Reference Model (SCORM) . The main limitation of the SCORM-based courseware authoring tools is that they are based on a “single learner model” . Moreover, the interaction between users is abstracted in the SCORM. Also, the SCORM-based authoring tools limit the interoperability between systems to only content interoperability. On one hand, a main shortcoming of those systems is the re-usability and that they do not support all the required functionalities in a learning process. On the other hand, they are not flexible enough to support different pedagogical approaches and they require extensive redesign effort in order to be used in different domains . Our aim in this paper is to propose a system that covers part of these shortages. 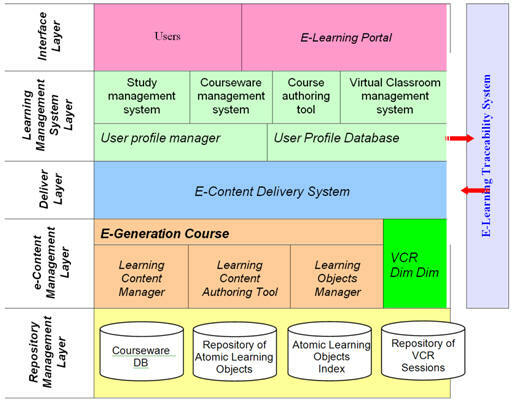 The architecture of the developed system is divided into a learning system and an E-learning Traceability System  as shown in Figure 1. The learning system is itself structured into five layers. The proposed architecture makes the functional responsibility more clear and tries to cover all the e-learning function components. We also define the learning objects exchanges protocol between each entity, which is related to current existed learning standards. Figure 1 below shows the functional model. The design of the e-learning platform depends on the needs of the different kinds of users . This architecture was enhanced by the development of an e-traceability system (ETS) . The ETS gives relevant information concerning the standards of design and development, program delivery and provides a relatively easy approach for the evaluation of the richness of e-learning resources and interactions. Using the ETS, we can evaluate the full course cycle from course design to course validation including authors, tutors and students’ participations. In the following section, we describe the proposed e-generation course component as a service layer based on the Repository Management layer. The e-generation course offers a set of tools to manage atomic learning objects, courses and any related teaching materials. In a previous work , we showed that part of our architecture is a repository management component. The latter includes learning contents. These contents are arranged into a Repository of re-usable Atomic Learning Objects, Atomic Learning Objects Index (ALOI), Courseware Repository and Repository of Virtual Class Room Sessions. Figure 2: ALO UML class diagram. Repository of Atomic Learning Objects (ALO): We define an ALO based on . An ALO may contain ALOs used in various stages of an e-learning objective. An ALO may be defined as a single idea about a specific topic, and can be displayed in one web page. It can be a short text, an image, an exercise, a video, an audio …etc. and can be equivalent to a one hour lecture in a traditional learning class. Figure 2 shows the UML class diagram of the ALO. The Educational Class groups the educational and pedagogic characteristics of the ALO and the Classification Classes describes this learning object in relation to a particular classification system . Atomic Learning Objects Index (ALOI): Nowadays, the most successful techniques for medium size databases combine online and indexed searching. The ALOI is a word-oriented mechanism for indexing an ALO in order to speed up the search task when we want to define an e-learning objective or to reuse ALO. The ALOI structure is composed of two elements: the vocabulary and the reference. The vocabulary is the set of main words that describe the learning object and each reference refers to an e-learning object. Courseware Database: The Courseware Database is divided into three levels. The first level contains a set of domains. Each domain represents a set of courses and it is related to a graph of precedence that describes the order of each course’s prerequisites. The second level contains plans of the Global Objectives of courses and General Objectives they consist of. The third level contains the Learning Objectives. Each learning Objective is organized in an AND/OR directed acyclic graph with the various nodes connected by arcs representing whether one is preliminary to another. Each node represents a reference to an ALO. Figure 3 shows the structure of the courseware database. This component offers services that allow managing the contents. This component focuses particularly in the creation, the import and the export of the related object from/to the Repository Management layer. Learning Content Manager: The Learning Content Manager offers a set of tools that allows managing courses, lessons and teaching materials. Once a course is built, the Learning Content Manager retrieves the related teaching materials and structures the ALOs into Learning Objectives according to the profile, the pedagogical purpose and the authoring process. The pedagogy and the authoring process mirror the activities of the teachers to conduct the courses in a heterogeneous environment and a collaborative and synchronous situation (context). The content is structured on the basis of the concept of the Learning Objective. As stated above, this latter is defined as a set of ALO that can be evaluated according to some performance goals to develop coherent information structures that help build knowledge schemata that are in the learner’s mind. The Learning Content Manager component allows previewing and publishing courses to the students via the E-content Delivery System. Governed by objectives, the content authoring tool creates the process of e-content structure, is. The author has to be aware of the required objectives and the information of relevance to the learner in each step of the course creation from the analysis to the evaluation step. Learning Content Authoring Tool: At the beginning, the author lays down the Global objective (GO) of the course that leads to a degree qualification or a certification. The GO is the highest stratum. Next, the course is built up of a list of Learning OBjectives (LOBj). Each LOBj may concern a lesson, a chapter, a theme, a specific knowledge etc.. Using the list of LOBj, the author will create the course plan. Next, the author examines each LOBj, where he has to keep in mind the specific knowledge that will contribute to attain either a more general LOBj or its related GO. The specific knowledge constitutes a learning objective which encompasses several Atomic Learning Objectives. A Learning Objective is organized in an AND/OR directed acyclic graph with the various nodes connected by arcs representing whether one depends on the other. Each node refers to an ALO in the Repository of Atomic Learning Objects. Each node has associated with it a weight. 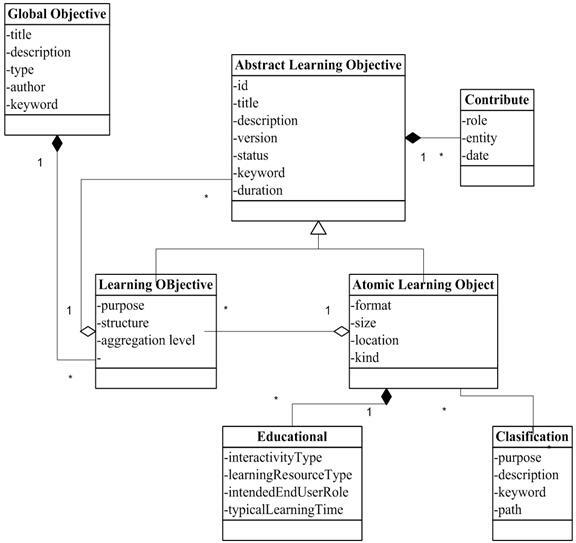 Learning Objects Manager: The overview of the meta-model is presented in figure 3. The learning objects manager allows authors to create and modify learning content objects. It allows authors to locate existing contents to reuse or to repurpose them rather than recreate them. This makes possible the use of the atomic learning object repositories allowing developing, indexing, finding, and reusing atomic learning objects. The learning content authoring tools is intended to help instructors developing multimedia-based e-contents using OCATLO  among other editors and focusing on creating an interactive content using various rich media. We presented in this paper the design of a course e-generation system. The system generates a sequence of atomic learning objects based on objectives. The course e-generation system focuses on content creation by proposing a clear e-content development methodology that reflects the modularization in the educational systems. It also provides an automation of the authoring activities based on a specific organization and structure of the content repository. One of the main issues that we intend to study is: How accurate the result is in terms of the coherence between the different Atomic Learning Objects in a Learning Objective, and between the Learning Objectives themselves within a generated course. Ahmad, H., Udin, Z.M., Yusoff, R.Z., “Integrated process design for e-learning: a case study”, The Sixth International Conference on Computer Supported Cooperative Work in Design, 2001, pp. 488-491. Anna T. and Marco R., “A General Architecture for M-learning”, Journal of Digital Contents, 2003, Vol. 2, pp. 31-36. Ambjörn N., Nilsson M., Palmér M., Paulsson F., “Contributions to a public e-learning platform: infrastructure; architecture; frameworks; tools”, Int. J. Learning Technology, 2005, vol. 1, n. 3. Blackboard - Educate. Innovate. Everywhere. http://www.blackboard.com. Gerhard, J., Mayr, P., “Competing in the elearning environment-strategies for universities”, Proceedings of the 35th Annual Hawaii International Conference on System Sciences, 2002, pp. 3270-3279. IEEE 1484.12.1-2002, “Draft Standard for Learning Object Metadata”, Sponsored by the Learning Technology Standards Committee of the IEEE]. Jeff Harris, An Introduction to Authoring Tools, March 2002 edition of ASTD's Learning Circuits online magazine. CHORFI H., Jemni M., “Evaluation and perspectives of an innovative Tunisian e-learning experimentation”. International Conference Advances in Infrastructure for e-Business, e-Education, e-Science, and e-Medicine on the Internet, L'Aquila, 2002, Italy. Koper, R. Learning Design. A handbook on modelling and delivering networked education and training. In Koper & Tattersall (Eds). Berlin: Springer, 2005. Moodle - A Free, Open Source Course Management System for Online Learning. http://www.moodle.org. Noble, D. “E-learning Application Infrastructure,” “Fool’s gold: Digital diploma mills, Part V”, 2001, http://communication.ucsd.edu/ Sun Microsystems . White paper of Sun Microsystems, 2002. Peter Van Rosmalen P., Vogten H., Van Es R., Passier H., Poelmans P., “Authoring a full life cycle model in standards-based, adaptive e-learning”, Authoring a full life cycle model in standards-based, adaptive e-learning. Educational Technology & Society, 2006, vol. 9 n.1, pp.72-83. Pythagoras K. and Demetrios S. “A flexible authoring tool supporting learning activities” In Proc. Of IADIS International Conference on Cognition and Exploratory Learning in Digital Age (CELDA 2004), Lisbon, Portugal, pp. 51-58. Hammami S., “Evaluating E-Learning Systems Using E-Traceability Systems”, journal of Computer Science, 2010, vol. 6, n. 2, pp. 210-216. Hammami S., Mathkour H., “The Implementation and Evaluation of an Online Course Authoring Tool”, Journal of Theoretical and Applied Information Technology, 2008, vol. 4, n. 9, pp. 780-788. Sharable Content Object Reference Model. http://www.scorm.com. Xiaofei L. , El Saddik A., and Georganas N.D., "An implementable architecture of an e-learning system”, presented at Electrical and Computer Engineering, 2003. IEEE CCECE 2003. Canadian Conference on, Montreal, Canada, 2003, pp.717-720.